Kirrawee Kangaroo’s Soccer Club, on Princes Highway, Kirrawee. May 18, 1970. (Photo by Antony Matheus Linsen/Fairfax Media). An accurate history of the formation of the Kirrawee Club has been difficult to establish as records and correspondence pertaining to the first two years have been lost. This report was compiled from information passed on verbally to Les Slade during the late 1950’s, and is believed to be reasonably accurate. Prior to 1954 soccer players from the Sutherland Shire played in the St. George District Association under the old “Casuals” banner. As some dissatisfaction with the administration arose and a rapid increase in population in the area made a local competition possible, a meeting was called to form an association within the Shire. This meeting was organised by Mr Fred Hand, Mr Alec Slater and Mr Allan Tredinnick. Three clubs entered teams in two age groups. They were Kirrawee, Miranda and Caringbah. With so few teams and clubs participating they were often meeting the same opponents week after week. The ages catered for were under 10 years and under 12 years. In the under ten years, all players from 6 to 10 years played together, and the very young soon learned to mix it with the big boys or retire for a season or two. Referees gave their services on a voluntary basis, but players paid a fee of threepence (3 cents) per match. Although Kirrawee tams competed, it is doubtful if an organised club existed. It would appear that in 1954 and 1955 two teams were representing Kirrawee with Fred and Nell Hand in complete control. The following year (1956) Harry Collett and Lionel Ford were involved to some degree, but without records it is difficult to assess how much they participated in organising the teams. On Thursday February 28, 1957 a meeting was held at the home of Mr L. Ford, 755 Kingsway, Gymea. The purpose of the meeting was “to form a club to organise teams of children to play in the soccer competition of the Sutherland Shire”. Mr Ford and Mr Harry Collett addressed the meeting and explained just what had given rise to the proposed formation of the club. As minutes of that meeting state that the “club” had two sets of shirts; 1 red and white, the other green and gold. It would seem that although this meeting was to form a club, it also recognised that a form of club was already in existence. The following officers were elected for three meetings. Acting President H. Collett, Acting Secretary L. Ford, Acting Asst. Secretary D. Wilson, Acting Coach P. Nicol. These members were duly elected to those positions at the appropriate meetings for the year. Club colours were decided on and all teams were required to wear red and white and would be known as “Kangaroos”. Previous names as Dragons, Colts, Koalas and Kookaburras were fashionable in the early days of competition. During this season more teams were added bringing the total up to seven. In 1958 a meeting was held at Les Slade’s home to form a Ladies Auxiliary. This inaugural meeting on Tuesday March 18 was the start of a group of hard working women who contributed so much in the financing of the club, and in particular money for building the club house. On May 20, 1958 the meeting was held at Les Slade’s for the first time. This was then to become the regular meeting place for the ensuing eight years. Many older members will recall some of the happy annual wind-up parties in Les’ garage. At the 1959 A.G.M, Les Slade nominated for president and was duly elected. As no nominations were obtained for secretary, Les asked that he be allowed to resign form his newly elected position. This was accepted and Ron O’Brian, who later became Shire President, was elected. Les stood for Secretary and the club was back in workable order. That would have to make Les the shortest term president ever, and he went on to become Kirrawee’s longest serving secretary. Playing fields have always created problems for clubs, and Kirrawee have had their share of changes. The early years were spent at Miranda Park which is on The Boulevarde west of Wandella Road. Then in 1958 a “licence to hire” land at the rear of Gymea Technical College was granted. Before long, working bees had cleared trees, blackberries and old fowl pens to make room for a home ground. The club owes a lot to Gordon Guilham for the work he did with earthmoving equipment at a very nominal fee. The donation of timber from Bests Timber Yard and galvanised iron from Brownbuilt enabled a canteen about six feet by five feet and two one-seater toilets, pan served, when the sani man decided to call, to be erected. We now had some facilities of our own, but on busy days? Phew! As the number of teams expanded a second field was established at Hotham Road, again with assistance from Gordon Gilham. Later we were allocated a field at Forest Road. When St. Pat’s club started they had nowhere to go, so we voluntarily handed over Forest Road. While this caused considerable inconvenience for that time, it placed us in a good position later on to apply for Kareela. Thanks to the efforts of Laurie Haynes, we were fortunate in having a building donated for a club house. This was in Ultimo, and was removed and stored by voluntary labour and we hoped to erect this on the Hotham Road area. 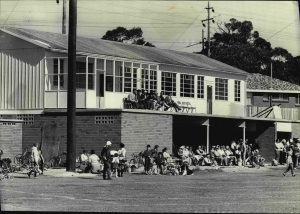 In 1967 Sutherland Council accepted plans for the erection of the club house (the building that is now the top floor at Kareela) on Hotham Road site. However this was overruled by the State Government Real Estate Office. Despite many letters and delegations we were unable to proceed. On November 14 a letter from Sutherland Council suggested that Kirrawee Club consider a proposal to build on the site that our building now occupies, as council were going to develop that area, then used as a pole dump, into playing fields. We accepted this proposal with a great deal of satisfaction. New plans were prepared by Laurie Haynes and Bill Dobbie and we laymen could not believe that such a structure could come to fruition with such a small outlay as we could afford. Long delays in getting permission to build and a lease (20 years) on a field held up the project. However, on May 14, 1968 council approved the erection of the club house and work began not long after. On Wednesday February 17, 1971 the full front page of the Shire Pictorial was taken up with a photo of our opening day, held the previous Sunday. There is no doubt that a building of these proportions would never have eventuated without the dedication and knowledge of Laurie Haynes. He gave Kirrawee a building for around $10,000, most of, if not all the money, coming from the Ladies Auxiliary. Today the building is worth around $100,000. Laurie Haynes and Les Slade were the recipients of life memberships of Kirrawee.